When choosing the best Lycra padded bicycle shorts, the most important qualities are comfort and functionality. Bicycle shorts were made of wool at one time, which became uncomfortable on long rides, especially in wet weather. Lycra bicycle shorts are a much better option. Today’s Lycra bicycle shorts are made to fit the body like a second skin, and feature moisture wicking fabric to prevent chafing and sores, and to stop bacteria (. Advances have been made in bicycle shorts that make them an absolute essential for any rider. Bicycle shorts come in either 4 panel, 6 panel or 8 panel styles. The 4 panel shorts are probably best used as workout shorts, when sitting in a more upright position. The more panels featured, the more curvature the shorts will have, providing the rider with the desired second skin type fit. The 6 panel or 8 panel shorts are best for road cycling. Usually 8 panel shorts are considered to be higher end, with a higher price tag. The more contoured the shorts are, the better they will fit, and the more comfort they’ll provide to the rider. The lining in the shorts is just as important as their construction for providing comfort on long rides. Real chamois (pronounced “shammy”) was once used, but is basically made of real leather, and had to be maintained much the way real leather does. A better option is a washable, synthetic chamois, which is much easier to care for, and becomes softer the more the shorts are washed. 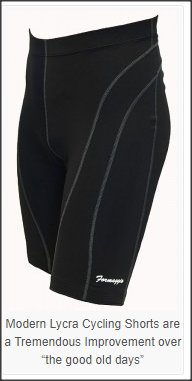 Lycra padded bicycle shorts come in either a lightly padded version, or with more padding. Padding can be foam or fleece, and the amount of padding, from very little to heavier padding is purely the choice of the rider. The thing to look for is that the padding has a layer of fabric that wicks moisture away from the body, this is crucial on long rides. Another important feature is flat seam construction. When seams on padded bicycle shorts are raised, they will become uncomfortable as the rider moves, eventually causing chafing and sores. It is best to try on several pairs of shorts before deciding, to determine the type best for the individual. When trying on cycling shorts, remember to bend into a cycling position, as this is the position one will be in when wearing them. Then check for bagging, wrinkling, puckering, or anything else that would affect the choice of shorts. There is another type of padded bicycling shorts called bib shorts, and sometimes riders prefer these over traditional shorts. They feature suspenders that go over the shoulders, and a flat panel in back. One of the big advantages of these is that there is no waist band in them. If a waist band becomes uncomfortable on long rides, these can be a good alternative to help provide riders with extra comfort. There are some differences between Men’s cycling shorts and Women’s cycling shorts. Women’s shorts have smaller waistbands, and are more tapered above the hips. Men’s shorts on the other hand are wider in the waist and have a longer leg length. The shape of one’s body determines the short that is best for them, if a woman is built more straight up and down through the waist and hips, a Men’s short may be a better option. The important thing is the rider’s comfort. The best advice is to try on several pairs of padded bicycle shorts to find just the right fit before purchasing. When one is going to be riding a long distance, it is extremely important to be comfortable on the ride.